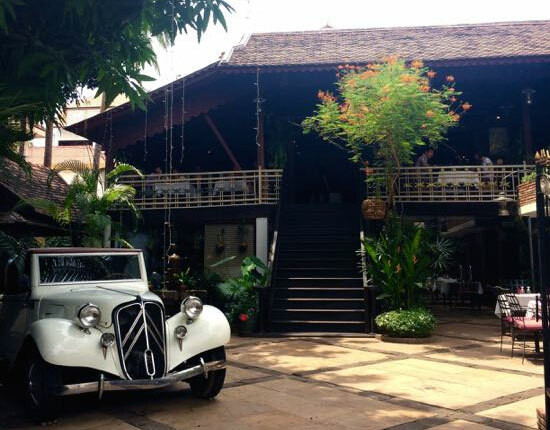 One of the last traditional Khmer wooden villas remaining in the centre of Siem Reap is home to Cafe Indochine, creating a romantic, intimate setting for this classic Khmer restaurant with some additional international turns. In early 2015, the restaurant came under new ownership by a small group of highly experienced hospitality professionals, and while they haven’t made many significant changes to the appearance of this lovely spot, they have been working hard on the service and fine-tuning the menu. You’ll find all of the classic Khmer dishes here, including beef loc lac ($9), pork in caramel sauce ($6.50), fish or chicken amok ($7) and fish or beef in a chas kruang spiced mix ($6.50), and they also offer a range of soups, fried rice, sweet and sour and curry dishes. On the international side, the French are ably represented with a selection of hearty, generous salads, including salad Nicoise for $6, or tuna salad for $5.50, that are full meals in themselves. The Italians also get a word in, with a range of tagliatelle dishes paired with sauces, like bolognaise, carbonara, mushroom, Napoletana, and even vodka sauce, all of which are $7, except the Napoletana which is $6. But many come here for the steaks, which are local and have been carefully sourced by the restaurant to ensure that they’re getting the best. According to the manager, it’s as good as anything they were previously importing from Australia, and in that case this makes the prices a steal. You can order a fillet with peppercorn, red wine or parsley butter sauce, served with French fries, pureed carrot and French beans for only $11. The setting here is genuinely lovely and transports you back to a romantic world lit by storm lamps, where time is marked by soft jazz tempos. You can choose to dine inside the building, or downstairs in the garden, under the shade of a magnificent banyan tree. There is also an air-conditioned room, though this seems to be mainly for the use of groups. Outside, a classic 1930s Citroen lets you know you’ve arrived, and while the setting looks quite formal, the service is relaxed, friendly and attentive without being stiff or formal.